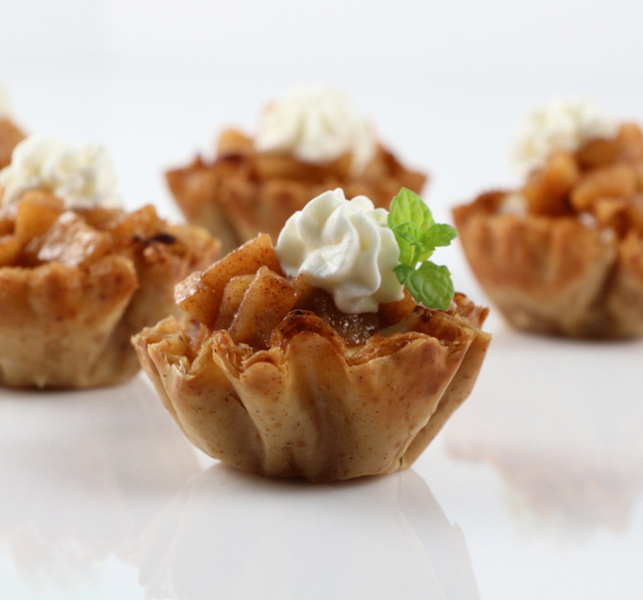 Savor the flavors of fall by serving up these easy-to-make, heavenly maple apple mini cheesecakes! Preheat oven to 350°F. In a medium bowl, beat cream cheese and 3 tablespoons sugar until smooth. Add maple syrup and egg, beating until just blended. Spoon or pipe into graham cracker phyllo shells. Place shells on baking sheet and bake for 12-15 minutes or until firm. Remove from oven and allow to cool. In a small skillet, combine apple, butter, remaining sugar, cinnamon and cloves. Stirring occasionally, cook over medium heat 4-5 minutes or until apples start to soften. When cooled, spoon apple topping on each cheesecake. Do not replace the pure maple syrup with pancake syrup as the consistency will not be the same. 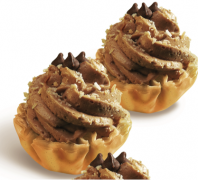 These bite-sized desserts pair a creamy filling featuring Kahlua, coffee and chocolate with a Mini Phyllo Shell for an irresistible added crunch. 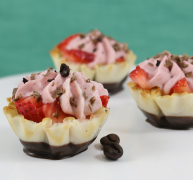 This mini tarts recipe is sure to be the star of the dessert table!